E-mail is the most effective way to promote any product or service online. It is a direct & simple way to communicate with your customers or users. Email marketing is one of the most trusted & popular online marketing channel available to organizations. This is best medium to show your interest into customers which indicates that you care about them & want to work with them. 1. It’s an affordable marketing way. 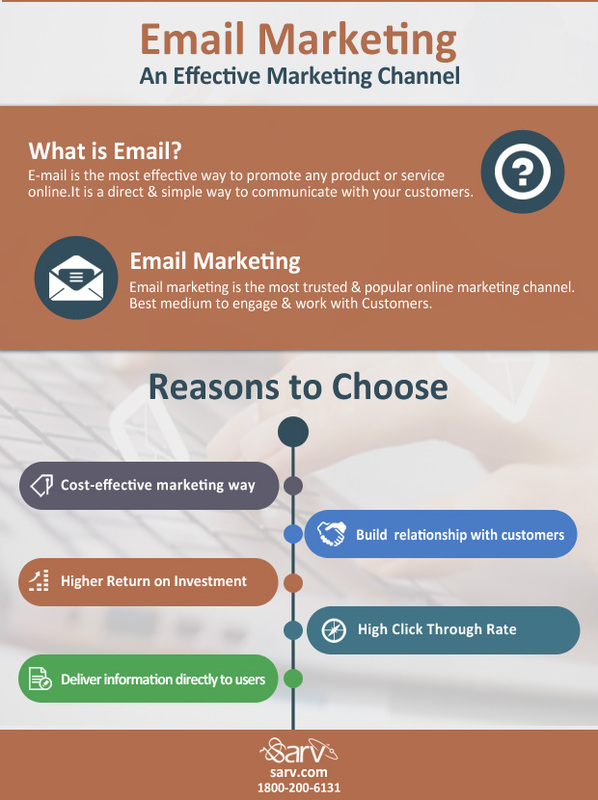 Email is the most cost-effective and easy medium than other marketing tools. It allows you to reach millions of users at very affordable cost. So, small business owners can also adopt email marketing for their businesses. 2. It helps to build close relationship between organization & customers. You can personalized your emails & deliver them to opt-in subscribers. You must keep engage with your customers on regular basis. 3. It is a measurable marketing tool, you can easily track & measure number of emails opened, bounce rate, CTR & unsubscribers. Email has more higher ROI (Approximately $44 per $1 spent) than other marketing channels. 4. It has high CTR (Click Through Rate). You can improve your CTR by optimizing some factors in email campaigns like engaging subject line, user friendly & educational content, calls to action etc. 5. It is a medium which Deliver information directly to your customers. It is very effective to keep customers informed about your services & offers. Emails allow you to stay connected with your audiences & keep updating them about your products or services.